The public has started a petition asking the White House to investigate comments made by MPAA CEO Chris Dodd a few days ago on Fox News. Closing a tumultuous week of wide protest against PIPA and SOPA – two MPAA backed anti-piracy bills – Dodd threatened to stop the cash-flow to politicians who dare to take a stand against pro-Hollywood legislation. Clear bribery, the petition claims, and already thousands agree. Responding to the mass protests against the PIPA and SOPA bills on Wednesday, the MPAA has revealed its true nature. 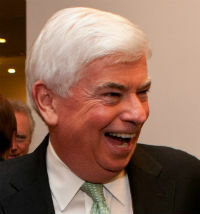 First, MPAA CEO Chris Dodd described the blackouts of Wikipedia, Reddit and others as corporate PR stunts which manipulated and exploited the sites’ users. “Some technology business interests are resorting to stunts that punish their users or turn them into their corporate pawns,” Dodd said. Then, a few days later when many lawmakers had already dropped their support for the anti-piracy bills, the MPAA’s comments turned even more grim. Talking to Fox News, the MPAA’s boss threatened to stop contributing to politicians who don’t back legislation designed to protect Hollywood. “Those who count on quote �?Hollywood’ for support need to understand that this industry is watching very carefully who’s going to stand up for them when their job is at stake. Don’t ask me to write a check for you when you think your job is at risk and then don’t pay any attention to me when my job is at stake,” Dodd said. Although it’s no secret that the movie industry has a powerful lobby in Washington, explicitly admitting that bribery is one of the tactics the MPAA uses to have their way wasn’t well received by the public. A few hours ago a White house petition was started to investigate Chris Dodd and the MPAA for alleged bribery. “This is an open admission of bribery and a threat designed to provoke a specific policy goal. This is a brazen flouting of the �?above the law’ status people of Dodd’s position and wealth enjoy,” the petition reads. In just a few hours the petition amassed more than 5,000 votes and this number is increasing rapidly. As a former Senator, Chris Dodd has many friends in Washington so it’s unclear whether the petition will accomplish anything, but if the numbers grow big enough the White House won’t be able to ignore it either. The MPAA’s response to the PIPA and SOPA opposition this week is a sign that they might be losing control in Washington. At the very least, they are starting to lose their patience and become frustrated, which may not help their cause at this point.